Here’s another Halloween dessert recipe that the kids will be sure to love. Adults will too, of course, because who doesn’t love sugar cookies? 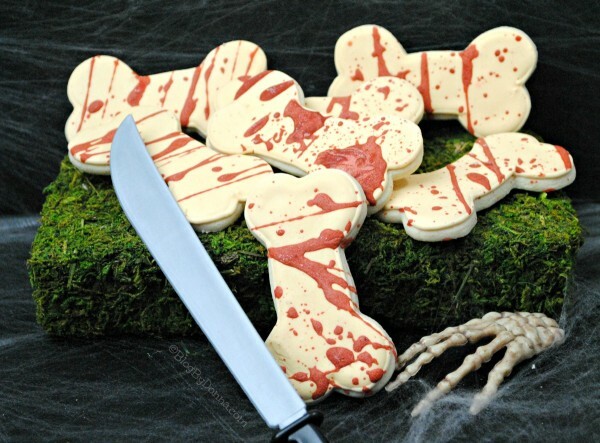 If you’ve been following my blog lately, you’ll notice that I’ve been following a theme… zombie and/or bones type recipes that will go great for a Halloween party or for the premier of season 7 of The Walking Dead on October 23rd. You can find recipes for Zombie Pasta, Bloody Bones Cupcakes, and a Zombie Cocktail, for the adults, of course. 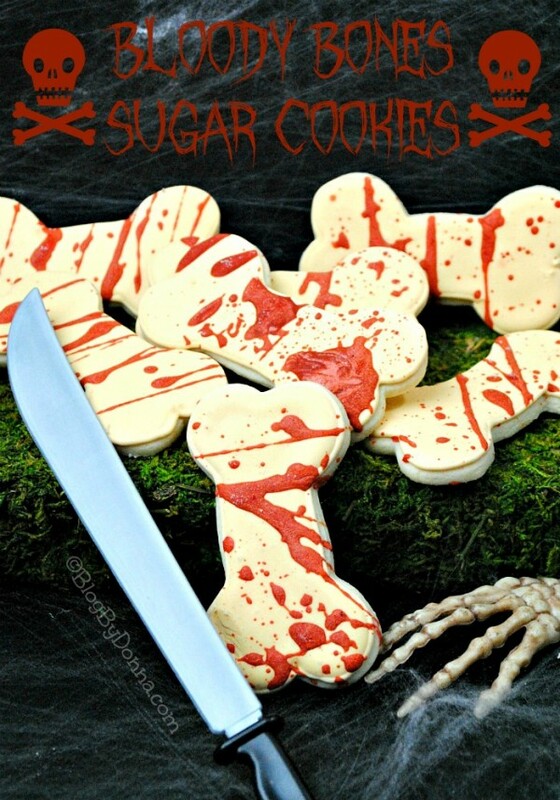 These Bloody Bones sugar cookies complete my ‘The Walking Dead’ premiere party and I think it’s a fitting menu. In a second bowl add the butter and sugar beating with an electric mixer until it turns to a light color. While still beating slowly add the egg and next the milk continuing to beat until everything is combined. Reduce the mixer speed to low. Next slowly spoon the mixed dry ingredients in with the wet ingredients. Divide the dough into two balls, wrapping them with cling wrap and place them into the refrigerator for at least two hours or overnight. Line the cookie sheets with parchment paper. Take one of your dough balls out of the refrigerator, toss some flour on the cutting board for the cookies. If the cookie dough sticks to the rolling pin slightly rub some flour on it also. You will want your dough to be about ¼ inch thick. 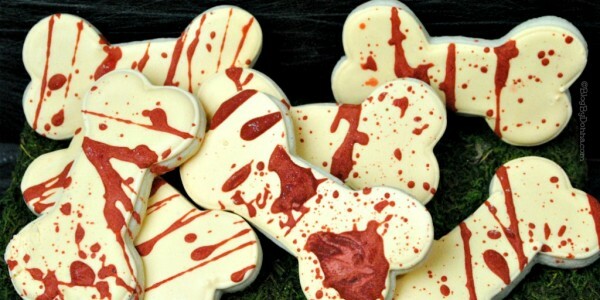 Cut out your cookies using a bone cookie cutter. Transfer cut cookies onto the lined cookie sheet. Leave a space between each for expanding when baking. Bake at 375 degrees for 7 minutes or until the cookie edges begin to brown. Remove cookie sheet from the oven but allow the cookies to cool on the cookie sheet for about 2 minutes. In a medium mixing bowl combine the butter, powder sugar and meringue powder next add 5 tablespoons of water beating on medium-high until stiff peaks form. Test your icing by taking a spoon full, turning the spoon upside down if the icing stays on the spoon it is ready. If it falls off the spoon add more powder sugar a tablespoon at a time until it reaches the desired consistency. Put ¼ of the icing into a separate bowl. Add several drops of the red gel food coloring, stirring to blend the red throughout all of the icing in the bowl. Spoon about ½ of the remaining white icing into a piping bag with a number 2 tip. Set aside the remaining white icing. Outline each cooled cookie with the white icing in the piping bag. After you have placed ½ of the white icing in the piping bag twist the open end of the bag to push the icing to the tip. Now carefully follow the outline of the cookie with the icing. Allow to dry for about 2 minutes before the next step. With the remaining white icing in the bowl, add a couple of tablespoons of water. Stir to blend, take a spoon and turn it so this icing will run off the spoon, it should look like syrup pouring off the spoon. If not add just a bit more water, if right the take a spoonful and put in the center of the cookie. Spread this icing with the tip of your spoon until it reaches the edges of the cookie. Use as much icing as necessary but be careful to not overdo as the icing will overflow onto the cookie sheet. Set aside and allow to dry for a few minutes. Last step, add a few drops of water to the red icing, stir well. Dip a spoon into the red icing and then dip or drizzle the red icing on each of the white iced cookies. I hope you enjoy these Halloween sugar cookies. These cookies are almost as fun to make, so let your kids help, as they are to eat. These are so cute for a Halloween party! looks like a good idea. And looks easy to make. These are so awesome!! I LOVE the blood splatter effect!